“I tell you, open your eyes and look at the fields! They are ripe for harvest” (John 4:35b). A revival had broken out in a small Samaritan village. Many people had become believers in Jesus as the Messiah and Savior of the world. One might think that this revival was the end result of some evangelism campaign strategy. It wasn’t. The text suggests that Jesus’ disciples were not even involved—only confused observers to a spiritual awakening that they did nothing to contribute to. It all began with a conversation Jesus had with a Samaritan woman at the famous well. A conversation about water became a spiritual discussion. But there was power in that encounter—the power of revelation that could only come from God. This woman, then, became a witness to her own people of God’s presence in the person of Jesus. They came to him and the revival began. 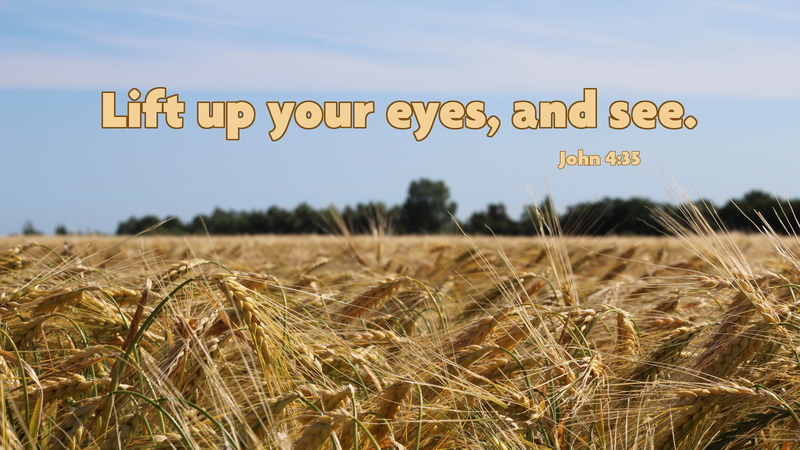 Prayer: Reveal to our eyes where you are working, Lord, so that we may join you in your harvest work. Amen.